Arabs reacted strongly on Monday to the deaths of dozens of Syrians in Hama at the hands of the Syrian army but most Arab governments kept silent, apparently fearing the power of protest movements that have spread throughout the region this year. “It’s no longer possible to understand the silence of Arab and Islamic states and organisations before the massacres against Syrians,” wrote Saudi columnist Hussein Shobokshi in the Saudi pan-Arab daily Asharq al-Awsat. Rights activists said 80 civilians were killed in Sunday’s tank-backed assault on the central Syrian city where President Bashar al-Assad’s father crushed an armed Muslim Brotherhood revolt 29 years ago, killing many thousands of people. U.S. President Barack Obama led Western condemnation of the attack, but there is almost no desire to intervene as Western powers have in Libya, where NATO bombing in support of rebels has failed to dislodge Muammar Gaddafi from his Tripoli base. Arab countries have said little about Syria, although in a rare comment, Egyptian Foreign Minister Mohamed Kamel Amr said his country was “very disturbed at the increase in the level of violence and the number of victims”, the state news agency MENA reported. Tunisian ruler Zine al-Abidine Ben Ali fled to Saudi Arabia in January during a popular uprising over poverty, corruption and repression, and three weeks later Egyptians had forced the exit from power of the U.S. and Saudi-backed Hosni Mubarak. Since then, protesters have been crushed in Bahrain, blocked in Yemen where President Ali Abdullah Saleh is clinging to power, and neutralised with promises of change by leaders of countries such as Morocco, Jordan and Oman. 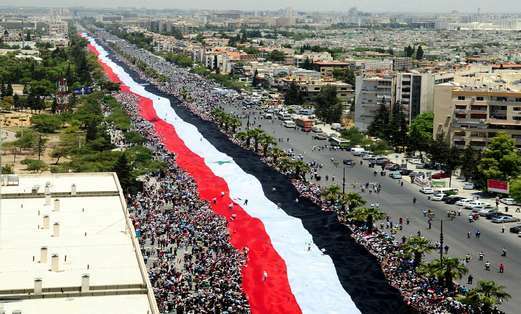 Syria has taken centre stage as the government’s response to democracy protests has become increasingly brutal. Assad’s Arab peers have watched nervously. Qatar, which stood out from the pack by backing NATO in Libya, closed its embassy in Damascus two weeks ago over fears it might be attacked because of the coverage of its TV station Al Jazeera. Arab League chief Nabil Elaraby urged Arab states on Monday to respond to the “legitimate demands of their people” and “abide by human rights” in a statement on MENA that did not mention Syria by name. “The world is watching the slaughterhouse in Syria. Shame on us,” Egyptian presidential candidate Mohamed ElBaradei said in a well-received message on social media site Twitter on Sunday. “The peace of God be upon Syria’s martyrs. Shame on every Arab and every human being,” he also wrote in Arabic. Though there was an outpouring of anger on social media among activists, immediate reaction was muted on the streets on the first day of the fasting month of Ramadan. “What happened yesterday in Syria is terrifying. If the international community is silent then many of the Arab rulers could commit similar massacres,” said Jalal Shujja, a Yemeni activist at Change Square where activists have been demanding an end to President Ali Abdullah Saleh’s rule since January. Hamdeen Sabahi, an Egyptian opposition politician who also intends to run for president, was visibly upset when he was informed of the Hama deaths during a Reuters interview. “There is no power or might but in God,” he muttered, then sat for several minutes in awkward silence. Though activists have been inspired by protests in other Arab countries, they have been locked in their own battles. Around 200 people staged a demonstration outside the Syrian embassy in Cairo on Sunday night, but Egyptian activists called for a major show of protest for Monday night. “I am certain that Assad will not have an easy exit and could end up killing half of his people before he agrees to give up powers but he will lose eventually as the people always win,” said Gamal Eid, head of the Cairo-based Arabic Network for Human Rights Information. In the Gulf Arab region, where Saudi Arabia has led what analysts have called a “counter-revolution” to bolster allies against protests, media reflected popular revulsion of Assad’s attempt to crush opposition but seemed to contrast that with the paternalistic rule of the Gulf ruling dynasties. In Saudi newspapers, headlines about Syria ran next to picture of King Abdullah and his Ramadan speech calling for Muslims to build “sympathetic, tolerant societies” in which “the wronged forgive those who have wronged them”. Saudi Arabia has had bad relations with Assad because of his close ties to Iran and the Lebanese Shi’ite group Hezbollah, but analysts say the Saudi royal family, which managed to deter mass protests at home, is conflicted over the possibility of seeing another Arab ruler fall. Kuwaiti authorities have suspended several clerics who criticised Assad in Friday prayer sermons, while Kuwaiti Islamists said this week they will mobilise in media and mosques during Ramadan against Assad’s government. In the United Arab Emirates daily al-Ittihad, the Hama story came below headlines announcing a round of massive housing loans. Having put five people on trial for attempting to mobilise for democratic reforms, the UAE has not allowed a repeat of protests at the Syrian consulate in Dubai in March. “Arab leaders are just not willing to stand up to the Assad regime and potentially damage the relationship. They don’t know if he’ll stay in power and there’s a chance he will,” said Shadi Hamid of the Doha Brookings Center. In Morocco, newspapers played down the number of Syrian deaths. King Mohammed has so far outmanoeuvred democracy protesters with a successful referendum on a new constitution that stops far short of making him a figurehead in a constitutional monarchy, maintaining his sweeping powers. “Arab governments are not reacting because they are concerned that the unrest will spread to other Arab states,” said Hilal Khashan, a politics professor in Beirut. “I don’t think that continued violence (during Ramadan) will have any official reaction from the rest of the Arab World,” he said.